Come to me, all you that labour, and are burdened, and I -will refresh you." (Matt. 11:28). O Jesus, how lovingly Thou dost call me closer to Thy Sacred Heart in Holy Communion, where alone I can find the rest that my troubled soul needs! And yet, instead of being Eucharist-minded, I am so very worldly minded. Invariably I take better care of my body than I do of my soul. Thou didst warn me against such a mistake: "Labour not for the meat which perisheth, but for that which endureth unto life everlasting, which the Son of man will give yon." (John 6:27). Holy Communion will give my soul life everlasting. This is Thy promise: "I am the living bread which came down from heaven. If any man eat of this bread, he shall live forever; and the bread that I will give, is my flesh, for the life of the world." (John 6:51-52). "He that eateth my flesh, and drinketh my blood, hath everlasting life; and I will raise him up in the last day." (John 6:55). O Jesus, I believe that it is Thy Divine life, given to me at Holy Communion, that will make my soul live forever. That Divine life flows into my soul during our union of love in Holy Communion, for Thou didst say: He that eateth my flesh, and drinketh my blood, abideth in me, and I in him. As the living Father hath sent me, and I live by the Father; so he that eateth me, the same also shall live by me." (John 6:57-58). This Divine Bread is the spiritual food of my soul. As food strengthens my body, Holy Communion nourishes and strengthens my soul by grace. It gives me the strength I need to overcome all the temptations of the world, the flesh and the devil. It gives me the help I need to practice virtue. Since Holy Communion means so much for my soul, I can do nothing better than to receive It frequently. It is Thine earnest wish that I do so. For this reason Thou didst make Thine Apostles priests at the Last Supper and didst order them to offer up Holy Mass in Thy Name. Thy words, "Take and eat; this is my body" were meant for me also. Since I offer the Holy Sacrifice together with the priest, I should also receive Holy Communion as the priest does, for Holy Communion is the Sacred Banquet to which we are invited for complete participation in this Sacrifice. Thou art present in this Sacrament, not only to offer Thyself for me, but also to offer Thyself to me, to be the Food of my soul. Thy Holy Church wants me to be Eucharist-minded even as Thou dost She urges me to receive Thy Sacred Body in every Holy Mass I attend and thus participate most intimately in the Divine Sacrifice. 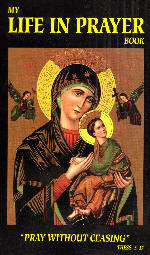 This was the spirit of the first Christians, and Holy Mother Church would have me imitate them. To live o/the Eucharist and by the Eucharist was the characteristic note of the early Church. / too wish to be Eucharist-minded and to make Holy Mass and Holy Communion my only treasure in this life. O Lord Jesus, nowhere is Thy love for me greater than in this Sacrament. Thy gift of love to me is nothing less than Thyself, whole and entire: Thy Body, Blood, Soul and Divinity. Thou art generous, not for Thine own sake, but for the sake of my salvation and happiness. Love for me urged Thee to leave with me the treasure of Holy Communion as a parting testament the night before Thou didst die. I can make no better return of love than to receive Thee often in this Sacrament of Love. My unworthiness and sinfulness should not keep me away from Thy Holy Table; [Fr. Lovasik is of course referring to venial sin, not to mortal sin], rather, conscious of my shortcomings, I should come to Thee more frequently, in order that my soul may be cleansed and sanctified. Only thus shall I become less unworthy of receiving Thee. Cure my blindness. Give me the grace to overcome my carelessness and lack of faith. O Jesus, be my Companion through life by frequent Holy Communion; be my unfailing Companion during the last painful struggle of death. Come in that decisive hour to protect my soul, which Thou didst buy with Thine own Precious Blood, and lead me safely into the home of Thy Father and mine. Help me to receive each Holy Communion as if It were my last. May It be my great devotion in life and my consolation in the hour of death. 0 Jesus, I thank Thee for Thy kind invitation: "Come to me, all you that labour, and are burdened, and I will refresh you." (Man. 11:28). My soul is weary and sad; come in Holy Communion and refresh it. Let my heart rest in Thee alone. I know that I cannot give Thee greater pleasure than by opening my heart to Thee so that Thou mayest abide there. Thou dost desire it because it is in this way that Thou canst most surely save my soul Thou didst become man and die on the Cross to save me. Apply the merits of Thy sacred Passion and Death to my poor soul in Holy Mass and Communion. I want to receive Thee at every Holy Mass I attend. I pledge myself to receive Thee as often as I can. From now on I am resolved to be more Eucharist-minded. Oh, please grant me that grace, for only then can I readily become a Saint! 1. Do you really long to be united with Jesus in Holy Communion, or is your heart filled with selfish and worldly love? 2. Truthfully, are you able to go to Holy Communion oftener than you do? Is there any serious reason that keeps you away, or is it simply carelessness or lack of faith? 3. If you were now on your deathbed, would you be satisfied with the love you show toward Jesus in Holy Communion? 4. Do you realize that at the hour of death your greatest consolation will be the Masses you have heard and the Holy Communions you have received? Aspiration for the day: I adore Thee at every moment, O living Bread from Heaven, O Great Sacrament.